Photive BTH3 Over-The-Ear Wireless Bluetooth Headphones . Condition is Used. Shipped with USPS Priority Mail. Photive BTH3 Over-The-Ear Wireless Bluetooth Headphones with Built-in Mic and 12. Condition is New. Shipped with USPS Priority Mail. Photive BTH3 Over-The-Ear Wireless Bluetooth Headphones with Built-in Mic and ..
Hawaii, and Alaska. FIND A LOWER PRICE?. Photive BTH3 Over-The-Ear Wireless Bluetooth Headphones. Bluetooth 4.0- Advanced CSR Bluetooth 4.0 technology. Stream your music wirelessly up to 33ft. Compatible with all Bluetooth-enabled devices (Bluetooth V2.1 and over);. Photive PH-BTE50 Lightweight Wireless Bluetooth 4.0 Earbuds. Ergonomically designed - Compact and lightweight wireless earbuds with in-ear design for secure fit and premium sound. Long lasting 8- hour Lithium-Ion battery. Bluetooth 4.0 Stereo Headphones- Advanced Bluetooth version 4.0 Latest technology. Compact form factor and stylish design: These headphones were designed to be small enough for you to comfortably tote around. Finally, a pair of Sweat proof Stereo Bluetooth Headphones that are truly wireless. Let nothing stand in the way of a killer workout, seamless run, or blissful practice. Crush your goals and keep moving forward. Mfg Part No. : 80292410933. BMW of Newton / Original BMW Accessories Phone Available. bluetooth version ISSC4.0. Original BMW Accessories. BMW Lifestyle. BMW of Newton is an authorized BMW Center located in Newton, New Jersey. Connect it to any Bluetooth-enabled device. You'll love the minimal design and simple interface. The EB200 wireless headphones are Ideal to connect to a Smart Watch, Smartphone, Tablet, and many more Bluetooth Enabled devices creating a truly wireless experience. Photive PH-BTE50 Wireless Bluetooth Earbuds. Wireless Sports Earphone Headphones. Condition is New. Shipped with USPS First Class Package. Photive PH-BTE26 Sweat-Proof Wireless Bluetooth Earbuds with 10 Hour Battery. Noise Isolating Lightweight Secure Fit Sports Headphones. Water resistant & Sweat Proof- IPX6 rated to be water resistant and Sweat proof. Listen to your favorite tunes with the Photive BTH3 wireless headphones designed with the latest Bluetooth 4.0 technology. Includes Hard Travel Case. Photive BTH3 Over-The-Ear Wireless Bluetooth Headphones. Premium Sound - Secure Fit - Easy to Pair. - STRESS FREE CONNECTIVITY WITH MICROPHONE AND MULTI-FUNCTION BUTTON: The earbuds connect to each other effortlessly by just taking them out of the charging case. Engineered with Advanced Bluetooth 4.0 with HD APTX Codec. Listen to music the way the artist intended. Smallest, lightest on-ear design - The hf1's only weigh 5oz. Photive Sweat-resistant Wireless Earbuds PH-BTE50 Wireless Bluetooth Headphones- Advanced Bluetooth 4. technology with APTX codec. Weekend warriors and pro-athletes alike will appreciate the wireless freedom and excellent sound quality of the PH-BTE50 earbuds. Great item. Barely used. Excellent sound. Perfect for the gym or an active lifestyle. Wireless Bluetooth Earbuds Sports Earphone Headphones Photive PH-BTE50 Premium . Condition is New. Shipped with USPS First Class Package. 4.2 Bluetooth® stereo technology with 33-foot range. Includes charging case and USB cable. Photive Sweat Proof Wireless Bluetooth. Condition is Used. This was only used three times by my son, his father bought him a different color so he dont use this one anymore, instead of it collecting dust i might as well sell it. Photive HF1 Superior Sound Lightweight Bluetooth Wireless Stereo Headphones Black - Model# PH-HF1-BLK. These ultra lightweight stereo headphones from Photive feature a streamlined design with leather cushions that reduce ambient noise. Photive BT55G Sport Bluetooth Headphones with built-in Mic. BTE55G Wireless Earphones Small, Medium, Large Ear tips Universal USB charging cable Quick Start Guide 1- Year HASSLE-FREE Parts & Labor Warranty Bluetooth Wireless Music Streaming Hours of Continuous Playtime on a Single Charge Simple and easy to pair with many devices such as: iPhone, iPad, Android (Droid), Apple watch, Amazon Echo (Alexa), Fire tablet, Kindle, a desktop computer, laptop computers, and many more. Listen to your favorite tunes with the Photive BTH3 wireless headphones designed with the latest Bluetooth 4.0 technology. Includes Hard Travel Case. Includes Hard Travel Case. Photive BTH3 Over-The-Ear Wireless Bluetooth Headphones. Photive Sport secure fit & lightweight bluetooth earbuds are the way to go when exercising, equipped with high fidelity audio, sweat proof and support of music, videos and calls and a life battery of 7 hours rechargeable. You will not miss a beat. The package has been opened for picture display purposes, never used. Weekend warriors and pro-athletes alike will appreciate the wireless freedom and excellent sound quality of the PH-BTE55G Bluetooth earbuds. Built to endure the active life, these earbuds are well-constructed and thoughtfully designed. Photive Sweat-resistant Wireless Earbuds PH-BTE50. Photive PH-BTE50 Lightweight Wireless Bluetooth 4.0 Earbuds. Weekend warriors and pro-athletes alike will appreciate the wireless freedom and excellent sound quality of thePH-BTE50 earbuds. Engineered with Advanced Bluetooth 4.0 with HD APTX Codec. Listen to music the way the artist intended. TOP RATED VALUE - Affordable & stylish HiFi digital quality sound with good bass. Make sure this fits by entering your model number. 8-Hour Playtime Bluetooth 4.0 with APTX Wirelessly Connect up to 33ft Away. IPX Rated - Sweat & Water Resistant Protection Built-in Microphone On-board Controls - Volume, Play, Pause, and Calls. Premium Sweat-proof Bluetooth Earbuds with built in Microphone and 7 Hour Battery. 2015 Updated EB10 Model. - Photive EB10 Wireless Earbuds. Wireless Bluetooth Headphones- Advanced Bluetooth 4. technology with APTX codec. Premium Sound - Secure Fit - Easy to Pair. There are NO CABLES between the earbuds or anywhere close to them. Enjoy hours of music listening without any fuss of tangled wires. From working out at the gym to running, hiking, or just basically commuting, these earbuds are a perfect fit for any occasion.STRESS FREE CONNECTIVITY WITH MICROPHONE AND MULTI-FUNCTION BUTTON: The earbuds connect to each other effortlessly by just taking them out of the charging case. Photive HF1 Wireless Bluetooth Headphones - Comfortable Lightweight On Ear Headphones. Premium Leather Noise Isolating Stereo Sound - 12 Hour Battery. The Photive HF1 Wireless is a well-built Bluetooth headphone that sounds good in both wireless wired modes is super comfortable to wear. Photive HF1 Lightweight Bluetooth Headphones. Wireless On-Ear Headphones with ..
Photive HF1 Lightweight Bluetooth Headphones. Wireless On-Ear Headphones with Incredible HD Audio and 12 Hour Battery. Once you try them, you will instantly realize the difference. Manufacturer: Photive. Wireless Bluetooth Headphones- Advanced Bluetooth 4. technology with APTX codec. Ergonomically designed - Compact and lightweight wireless earbuds with in-ear design for secure fit and premium sound. 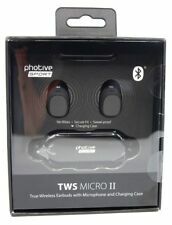 Photive PH-BTE50 Wireless Bluetooth Earbuds. Wireless Sports Earphone Headphones. Condition is New. Photive PH BTE50 Bluetooth 4.0 Wireless Sports Headphones with Built in Microphone. Photive Sweat-resistant Wireless Earbuds PH-BTE50 Wireless Bluetooth Headphones- Advanced Bluetooth 4. technology with APTX codec. Photive PH-BTE50 Wireless Bluetooth Earbuds. Wireless Sports Earphone Headphones. Photive PH-BTE50 Lightweight Wireless Bluetooth 4.0 Earbuds. Weekend warriors and pro-athletes alike will appreciate the wireless freedom and excellent sound quality of thePH-BTE50 earbuds. Photive PH-BTE50. Photive Sweat-resistant Wireless Earbuds PH-BTE50 Wireless Bluetooth Headphones- Advanced Bluetooth 4. technology with APTX codec. Wireless Bluetooth Headphones. Ergonomically designed - Compact and lightweight wireless earbuds with in-ear design for secure fit and premium sound.